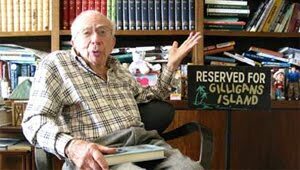 Sherwood Schwartz, creator of The Brady Bunch and Gilligan's Island, has passed away at the age of 94. Great-niece Robin Randall reports Mr. Schwartz passed away at 4a.m. Tuesday. A veteran of television, Schwartz worked on many classics including My Favorite Martian, Harper Valley PTA, and won an Emmy for his work on The Red Skelton Show in 1961. In addition to creating and producing Gilligan's Island and The Brady Bunch, Schwartz also co-wrote the very hum-able theme songs for both shows. In recognition of his genius, Schwartz received a star on the Hollywood Walk of Fame in 2008. He is survived by his wife of 69 years, Mildred, and their four children, Don Schwartz, Lloyd Schwartz, Ross Schwartz and Hope Juber. ~ POPped on behalf of Jonas Grumby (The Skipper), Roy Hinkley (The Professor), Eunice (Lovey)Wentworth Howell, Mary Ann Summers, and Sam (The Butcher) Franklin who married Alice Nelson,..